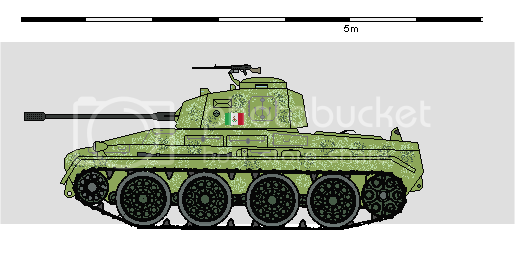 Here is the first model of a light tank equipped with a 3.7 cm gun as a primary armament. I really like this tank. Mind if I grab it for Mexico? Do you have any more specs for it? I'm glad you like it....feel free to use the drawing. Half tracked troop transport, not intended to win a beauty contest. shiny tank Didn't you think, that the camouflage is a bit too bright ? Of course not! It needs to stand out so the enemy can easily spot them in rocky terrain. Vegetation in Belize is tall light-colored grass. I was in the central Belize City to Belmopan area. It varies, but there is a lot of open grassy plains, I would say about 70%, and the tanks would mainly be used in that terrain and not the jungle. A few more camo patterns. OTL Mexican ones are too lame. Pink and brown make for some ugly camo. Dark grey would be for urban combat. Medium Tank model 1941/42 quipped with a 57mm gun.